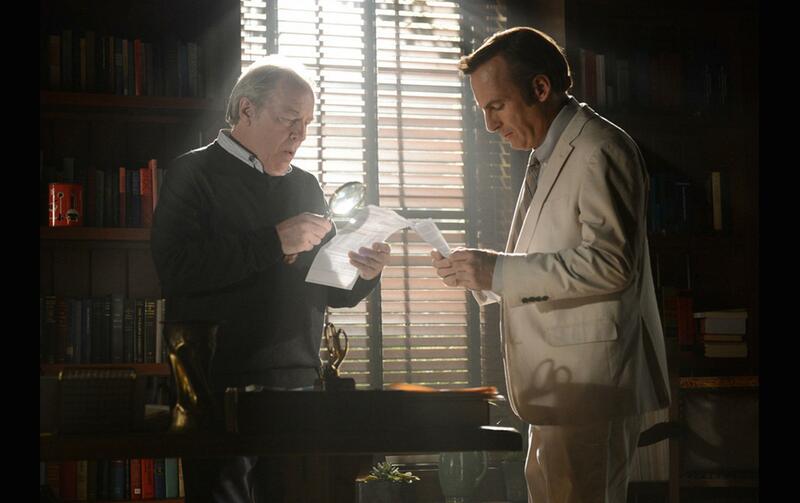 Once again Better Call Saul opens with a flashback. This time we follow Jimmy on his morning mail rounds in the offices of Hamlin Hamlin McGill. Taking us back to the day when Jimmy was still recovering from his Slippin’ Jimmy era he receives the news that he passed the Bar Exam and is now eligible to practice law in the United States of America. Desperate to land a job at HHM Jimmy asks Chuck to put in a good word, when Jimmy and his co-workers are enjoying some well deserved cake Howard Hamlin bursts his balloon behind closed-doors. In a lonely corridor with only the printer for company the viewer is left to speculate on the news Howard is giving Jimmy. Protecting us from Jimmy’s vulnerable side as we saw, or rather didn’t see, last week when Jimmy lashed out on a door, we’re able to read between the lines and determine the outcome of his spontaneous meeting with Howard. Bringing us back into the present day and Jimmy is still as enthusiastic as ever about his Elder Law and he soon spots an opportunity to gain serious recognition in a class action lawsuit against the nursing home the majority of his clients live in. Despite Mrs. Landry’s insistence that Sandpiper Crossing is “all very above-board” Jimmy is sceptical of the Sandpiper operation when he notices the tiny small print, suggesting systematic overcharging for everyday amenities such as Q-tips and toilet paper. Returning to Chuck’s house with a flurry of enthusiasm in tow Jimmy turns to the boxes he left for storage. Jimmy’s devious plan to get Chuck working again worked a treat and the two recognise the potential magnitude of Jimmy’s discovery. Stirring Chuck’s intrigue Jimmy rushes off to Sandpiper Crossing to meet with his clients and bring new evidence to the surface. Refused entry by the hard-nosed secretary Jimmy is forced to improvise when he spots an office clerk shredding potential evidence that would build his case. 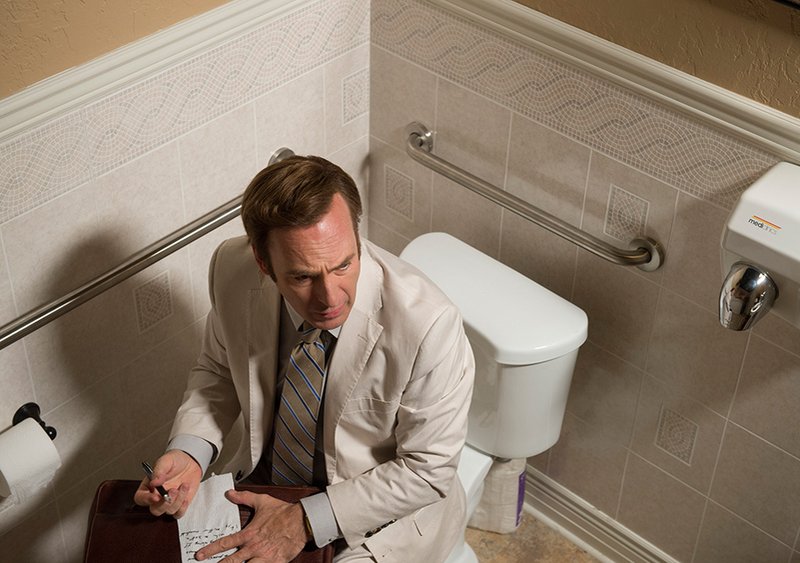 In true Better Call Saul style only Jimmy McGill could draft a demand letter on toilet paper. In a panicked and confined toilet stall Jimmy hastily drafts his letter of demand to the lawyers representing Sandpiper Crossing, effectively calling for an end to the destruction of evidence and opening up a case of fraud against Sandpiper. Filing his loose case of pending litigation Jimmy is thrown to the curb and left to evaluate his next move. Remember way back to episode 3 ‘Nacho’ when Jimmy travels through the wilderness to the amusingly apt beat of Bobby Ware’s ‘Find Out What’s Happening’ and even more recently from ‘Bingo’ Mike’s detective work to the jazzy mystery soundtrack? Well, we’re treated to another amusing sequence when Jimmy takes his loyalty to his clients to the next level. Jumping into a dumpster swamped with all the expected trimmings of a nursing home rubbish bin Jimmy searches desperately for the office shreddings he witnessed earlier. Upto his neck in all sorts of nasty business he gives up and stumbles round the corner, right into the path of the paper recycling bin, poor ol’ Jimmy just can’t catch a break. Returning to Chuck’s with reams of paper shreddings demanding a long night of reassembly Jimmy gets to work in putting together evidence that will help his case. Quote of the episode – “You can’t say it’s private if a hobo can use it as a wigwam.” – In true Jimmy fashion his passion for words shines through once again when Jimmy explains the night’s escapades and ‘theft’ from public property. Chuck stumbles downstairs early in the morning to the sight of Jimmy floundering around on a floor covered in paper and settles him down for a ‘nap’. Unable to draw his attention away Chuck sets about where Jimmy left off and forms the mother of all documents that will make their case. Effectively turning Jimmy’s discovery into family business Chuck voices his interest in making it a team effort between the two brothers. Forging enough evidence to warrant a call to Sandpiper Crossing’s lawyers the two settle down in a conversation that sees Chuck demand a $20 million settlement deal. Shocked by Chuck’s demands but nevertheless still on board Jimmy sets about writing up the necessary legal documentation. If Jimmy was shocked by Chuck’s call for $20 million it’s nothing compared to the epsiode’s closing scene. A distracted Chuck rifles around in Jimmy’s car for documents, brushing aside mobile phones and car keys in the process, under the heavy weight of power cables. When Jimmy breaks his concentration Chuck’s face says it all, dropping the box and cutting to closing credits. In an episode that raised the legal narrative a bar or two some of the rhetoric gets a little lost but the episode as a whole plays out neatly and develops some recurring stories; including Chuck’s electromagnetic hypersensitivity and Mike’s relationship with Stacey and Kaylee. In next week’s episode entitled ‘Pimento’ will the consequences of Chuck’s 20 foot adventure make the headline or will the pair actually have a case against Sandpiper Crossing? Until next time happy viewing.